A blossom of the flower called quinchamali (Quinchamalium chilense), a Patagonia endemic blooming alongside the trail to Pliegue Tumbado. 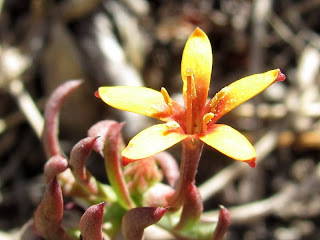 The flowers of this plant bloom in clusters; this is a view of one of those blossoms. The view looking westward from Pliegue Tumbado. 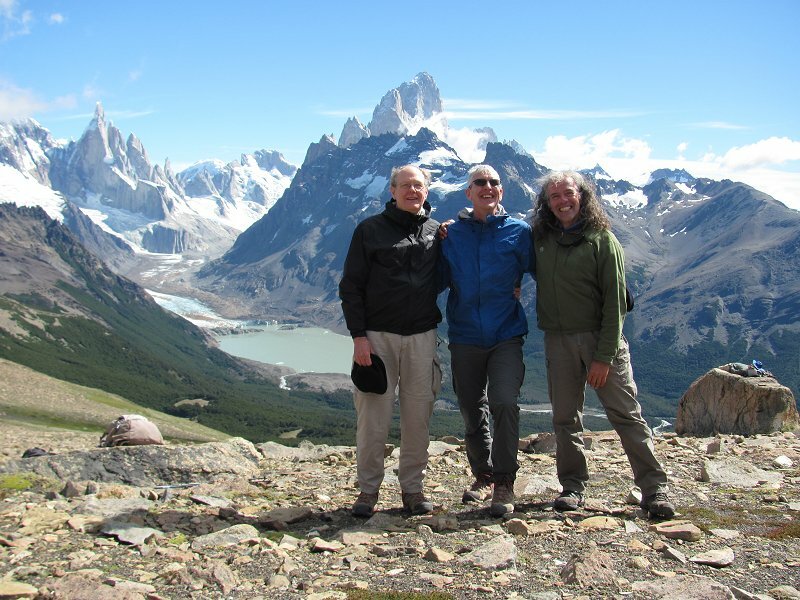 In the center is the rocky summit of Cerro Piergiorgio and to its left is the Domo Blanco ("White Dome"). 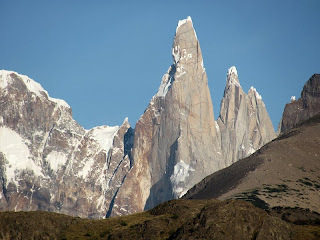 The rock spire of Bifida is to the far left. 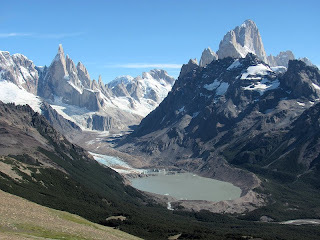 Lago Viedma as seen from Pliegue Tumbado. 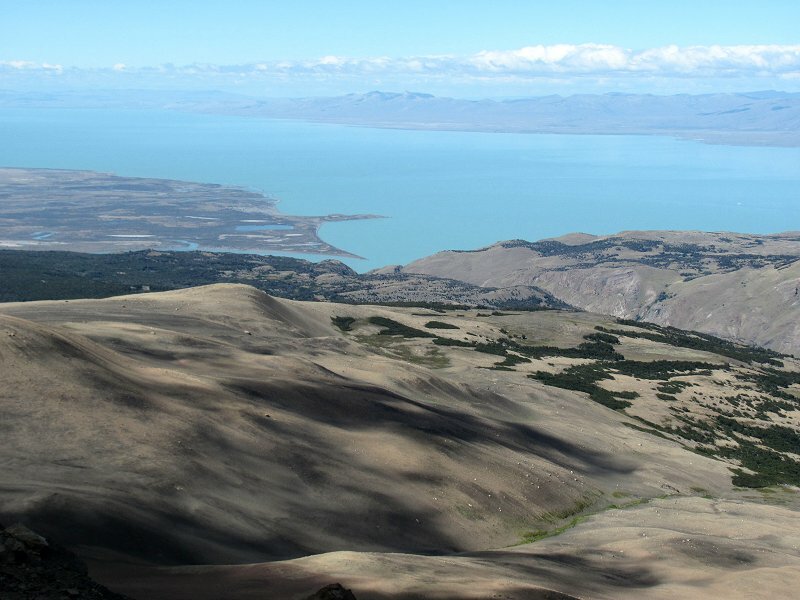 Lago Viedma stretches for about sixty miles into the Patagonian steppe. The Viedma Glacier, Argentina's largest, flows into the head of the lake from the Southern Patagonian icefield (Hielo Sur). 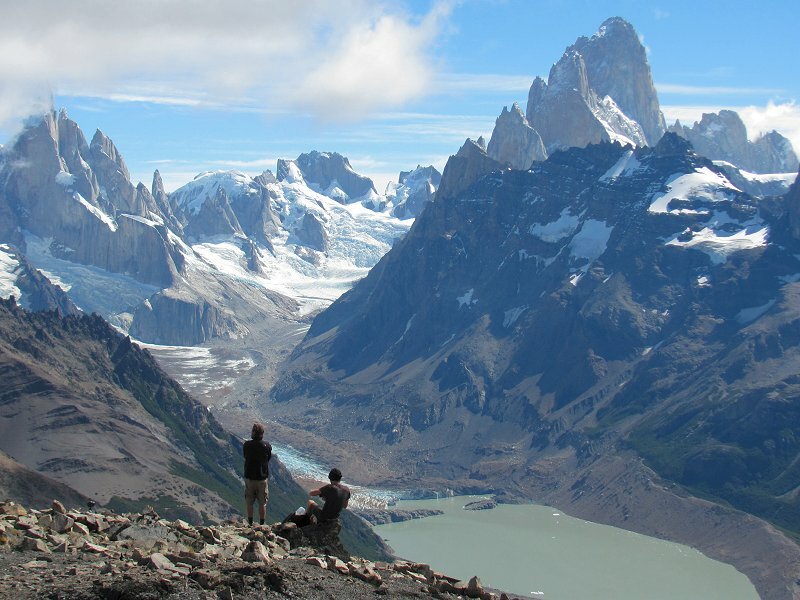 Two hikers silhouetted against the astounding backdrop of Cerro Torre (left) and Monte Fitzroy (right). Grey-green Laguna Torre lies cupped within a glacial moraine at lower right. Three "Davids" atop Pliegue Tumbado. The three spires of Cerro Torre, Torre Egger and Cerro Standhardt in the left background; Monte Fitzroy in the center background. The "classic" view from Pliegue Tumbado. The Cerro Torre group to the left and Monte Fitzroy to the right. 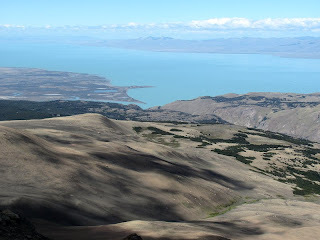 Laguna Torres is the lake in the foreground hemmed in by a glacial moraine. 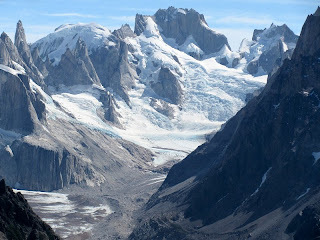 The Fitzroy massif as seen from the Pampa de las Carretas above El Chaten. 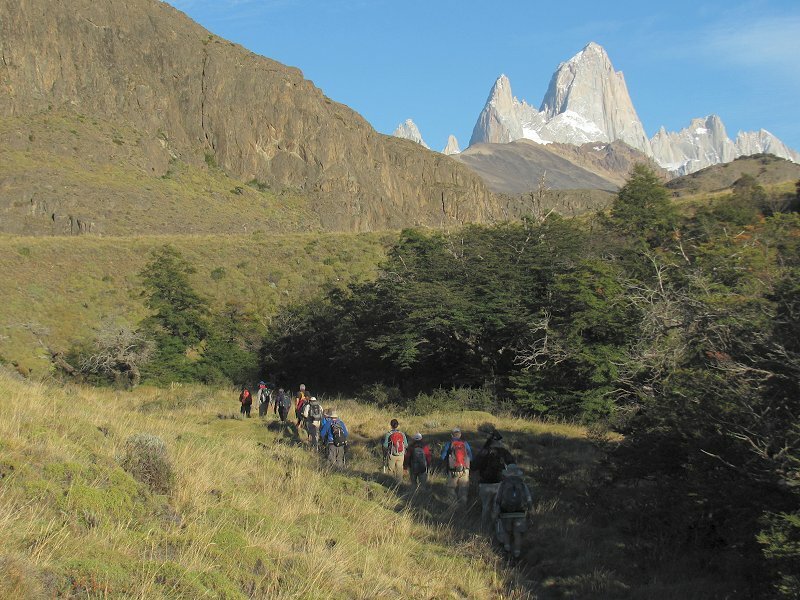 On the trail to Pliegue Tumbado. Monte Fitzroy in the background. 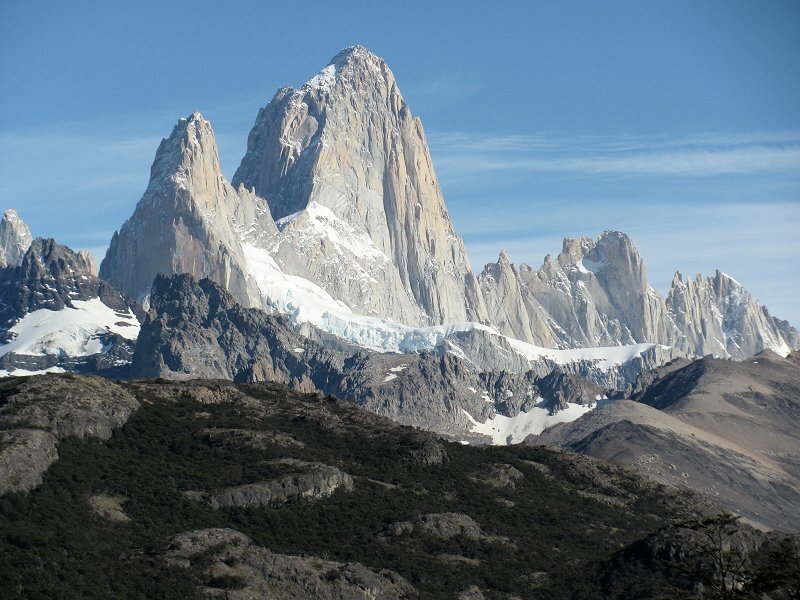 The spire of Cerro Torre sails into a clear Patagonian sky at the start of the hike to Loma del Pliegue Tumbado ("Ridge of the Recumbent Fold").